The Fisher Scientific 4°C Lab Refrigerator Freezer Combo delivers dependable everyday sample storage with the flexibility of both refrigeration and freezing capacity in a single foot print. This freezer refrigerator combo has a capacity of a 13.1 cu ft Refrigerator area and 5 cu ft of freezer space, for a combined 18 cu ft of storage space. This lab Refrigerator and freezer has an easy access, up front thermostat with individual controls for the freezer and refrigerator, with adjustable shelving and clear drawers, and in door storage to help locate items quickly. The exterior of this lab refrigerator is a corrosion resistant epoxy powder coat and the unit only requires 1” clearance for optimal performance. Doors are reversable to suit your lab’s needs. Please note this unit is intended for use in a lab environment only and not for use storing food or items consumed by humans. 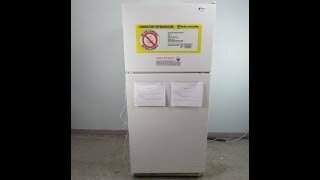 This Fisher Scientific 4°C Lab Refrigerator/Freezer Combo has been fully inspected and comes with current temperature validations. All of our lab equipment comes backed with our standard warranty. Should you have any questions, please don't hesitate to contact us.